Please Credit Photo: NY Style Mambo at Ailey Extension. Photo by Kyle Froman. Originally from Cuba, the Mambo is enjoyed throughout the world because of its high energy and infectious rhythms. NY Style Mambo had its humble beginnings at the infamous Palladium Ballroom. This style is a flirtatious dance component that includes the basics, body movement, steps, footwork and timing. Students learn the foundation of Mambo dancing with occasional points, kicks, and exaggerated hip movements combined with long, flowing movements and sharp quick steps. (New York) May 30, 2018 – As the Ailey organization heads into its 60th year, Ailey Extension will offer a variety of indoor and outdoor dance classes free to the public this summer. In collaboration with the NYC Parks, Ailey Extension brings dance to public parks in Brooklyn and the Bronx from June 5-July 14, offering eight technique and choreography workshops, including events dedicated to Alvin Ailey’s acclaimed masterpiece Revelations. To celebrate NYC Dance Week, a citywide festival from June 14-23, Ailey Extension welcomes new students* to try over 30 free classes at The Ailey Studios in Manhattan, New York City’s largest building dedicated to dance. 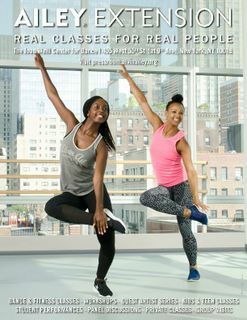 Ailey Extension celebrates NYC Dance Week, a citywide festival from June 15-24, by offering 30 free dance and fitness classes for new students. Continuing through Alvin Ailey American Dance Theater’s Lincoln Center engagement June 14-18, free classes will be held at The Ailey Studios – home to the world-renowned Ailey dancers – featuring nearly all of Ailey Extension’s 25 techniques, many taught with live accompaniment. Join us as we learn how to dance some New York style mambo. We're with Katherine Jimenez at Ailey Extension in New York City who will teach some beginner steps.